Main Floor: 1656 sq. ft.
Total Square Footage: 1656 sq. ft. The Somerset log home features a modern single story lifestyle for those looking to live in a ranch design. The double gables across the front elevation add a unique element to the overall appeal of this home. Watch TV while doing the dishes or easily visit with guests as the meal is prepared. The three bedroom, two bath design is great for those empty nesters looking to simplify their life. The open area living area allows for easy navigation and access. 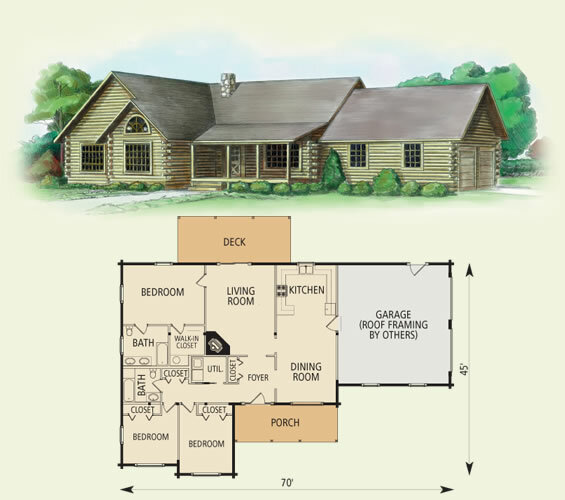 The attached garage and outdoor porch and deck make this log cabin floor plan a top contender for consideration.